Published on July 7, 2012 by Martyn. Be the first to comment! 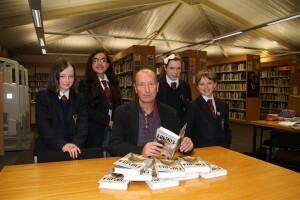 The latest stopping point on the “Flip tour” of schools was a short hop down the road at Bradford Grammar, where I gave a talk and reading to the whole of Year 9 and ran a creative workshop for an English class from the same year group. I also had time to drop by the library to meet students from the school’s Chatterbooks and Bookaholics lunchtime reading groups and chat to them about Flip and about our favourite teen/YA books. The picture, showing me with some of the group, is reproduced with kind permission of the school.